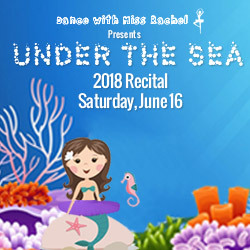 Join us on June 16 as Dance with Miss Rachel goes Under the Sea! Dancers ages 2 and up will take the stage to dance like dolphins, move like mermaids and jump like jellyfish in four spectacular shows- 9:30, 11:30, 2:00 and 4:00. See you on stage!